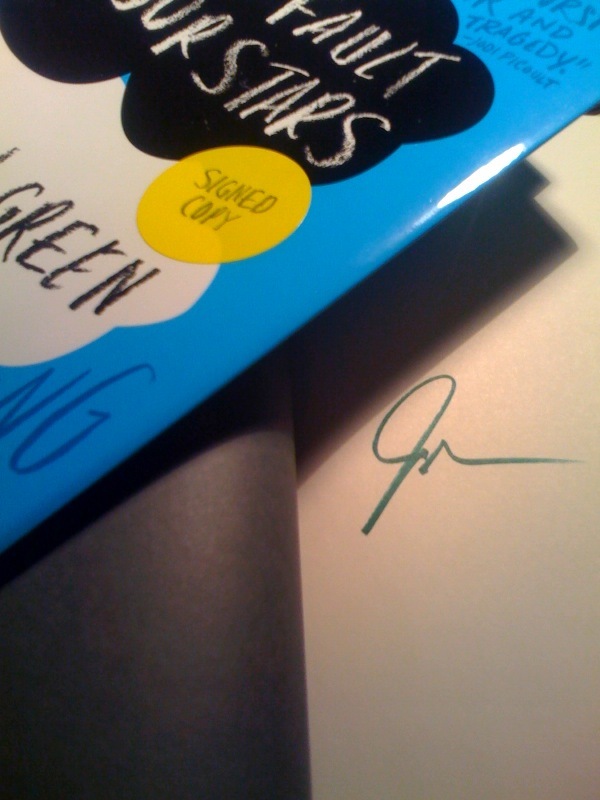 I've waited a few days to write about The Fault in Our Stars by John Green. It hasn't been very easy to collect my thoughts. For starters, it's the most recent book by an immensely popular author, a book that many, many people have been eagerly anticipating (anticipating far more than I have, to be honest). But more to the point is the fact that Green's latest novel is a bit perplexing in a way I've grown to associate with his works. The reason I've stuck with John Green over the years is because I like his style as an author. Back when I first read Looking for Alaska (and was thoroughly underwhelmed), I was struck by how easy-to-read his writing was. Green writes like he talks - a bit pretentiously, a bit unrealistically, but intelligently and with a lot of wit. Though I didn't really like the plot or characters in Green's debut, I stayed up until two in the morning to finish reading it, concluding that it just wasn't my style. And so the following year, I read Green's second novel, An Abundance of Katherines, which I quite enjoyed. In my growing, adolescent mind, the differing approaches of the two books made John Green an author worth reading, even if aspects of his writing were bothersome. I only read Paper Towns, Green's third novel for young adults, after becoming well acquainted with Green's prolific online persona, as I reached the end of adolescence. The fact is that he truly writes like he talks - within the context of his personality, the way his male protagonists behave and the way things happen make it easier to forgive him for common young-adult novel transgressions (like the fact that all of his characters are unreasonably clever and witty and often sound very similar to each other). Which leads me back to The Fault in Our Stars, which is both very similar to every other John Green book I've read until now, and markedly different from all others. Like everything Green writes, the characters in The Fault in Our Stars are pretentious and clever and witty and thoroughly self-aware. It should be annoying, but unlike Paper Towns (where I did ultimately feel annoyed but managed to ignore it...), I wasn't even bothered. Maybe it's because The Fault in Our Stars is narrated by a girl (a first for Green), maybe it's the fact that it's such an emotionally charged book, and maybe it's just that it's better written. On a technical level, I knew I could be bothered... but I wasn't. The Fault in Our Stars does a very good job of breaking free of its expected realm. It may be a love story, but it works as well for young men as it might for women. It may be about teenagers, but adults will find as much to relate to as their younger counterparts. It may be a bit too clever, but anyone can feel the powerful emotional punches this book throws. It may seem like a simple story, but the simplicity is deceptive - The Fault in Our Stars runs a lot deeper than would appear. The Fault in Our Stars is the first book by John Green I've purchased, having checked out all others from the library. I'm glad this is the one I bought. This is his best book so far and though my thoughts are still formulating, I suspect that I'll be coming back to reread it sometime soon. this has been getting great raves from everyone- glad you liked it too! I think the thing I found most touching was how he wrote the parent's of these kids. As a parent myself, I found those interactions the most real - he didn't shy away from the ugly, nor the pretty. When I open my pre-ordered copy I was expecting to read about five chapters and then go to bed. Instead, I ended reading it unitll the very last page. This book was, to simply put it, gorgeous and nothing less than astounding. A bock hasn't wracked my emotions like this since the last Harry Potter book. A must for all!